Aim and Objective: The main objective of this research was to formulate medicated polyherbal toothpaste with better antimicrobial activity from natural sources for dental infections. Materials and Method: The hydroalcoholic extracts of apple peel, lemon peel, orange peel, banana peel was carried out and the formulated toothpaste from the above extracts were subjected for antimicrobial activity study against Gram-positive bacteria (Staphylococcus aureus, Enterococcus faecalis, Streptococcus mutans) and Gram-negative bacteria (Porphyromonas gingivalis). Results: Antibacterial activity of the toothpaste was determined by the 2-fold serial dilution method. All the extract has showed good antimicrobial against P. gingivalis, with apple extract showing the best result (7.8 mg/ml). Conclusion: Thus, our study shows the potent antibacterial activity of the formulated polyherbal toothpaste compared with the marketed formulation against dental caries. In India, it has been found that a significant proportion of dental problems are due to microbial infections. Dental problems are of three types, formation of dental plaques, dental caries, and periodontal diseases. Dental caries results from the accumulation of plaque on the surface of the teeth and biochemical activities of complex micro-organisms. Streptococcus mutans is one of the main opportunistic microbes, which play a vital role in fermenting carbohydrates resulting in acid production and leading to the demineralization of the tooth enamel. India has a rich tradition of indigenous medicines for various treatments. However, nowadays people are more inclines toward the use of allopathic drugs. Hence, the traditional use of Ayurveda has come down a country which has medicine significant back more than a 3000 years and perhaps combinations of herbs must be known since then, but now people have all along been using drugs and the age-old techniques have been forgotten. After studying the drawbacks of commercial toothpastes, people are now more inclined toward the use of nonalcoholic toothpastes and herbal formulations. Herbal toothpaste does not contain the artificial colors, flavors or fluoride that many of the artificial products contain. Based on the above information an attempt is made to formulate new polyherbal toothpaste and to study its anti-microbial potency. The fresh apple fruits, lemon fruit, orange fruit, banana fruit, was collected from Reliance Fresh Belagavi, Karnataka, in the month of January 2014 [Table 1]. Authentication of the fruit was done by Dr. Harsha Hegde, Scientist, Regional Medical Research Center (RMRC), Belagavi, Karnataka. We used three facultative anaerobic Gram-positive bacteria, which included against Staphylococcus aureus ATCC No. 12598, Enterococcus faecalis ATCC No. 35550, S. mutans ATCC No. 2517 Gram-negative periodontopathi bacteria, Porphyromonas gingivalis ATCC No. 33277, in the present study. The bacterial stock cultures (stored at –80°C freezer) were obtained and the work was done at Basic Science Research Center (BSRC), KLE University, Belagavi, Karnataka. The bacterial stock cultures were thawed and placed in brain heart infusion (BHI) broth for aerobic bacteria and incubated at 37°C for 24 h. , The anaerobic bacteria were cultured in thioglycolate broth and incubated at 37°C, 5% CO 2 for 48 h. The inoculum was prepared by adjusting the turbidity of the suspensions to 0.5 McFarland standards earlier to minimum inhibitory concentration (MIC) testing. The bacteria were then tested using as a standard drug as ciprofloxacin. Four extracts (apple peel, banana peel, lemon peel and orange peel) 50% stock solution was prepared that is, (500 mg if the extract in 10% of dimethyl sulfoxide solution). The same procedure was also used for the determination of MIC of the marketed formulation and polyherbal toothpaste. Based on the sensitivity and the resistance observed by MIC results of the each extracts, the formulation was done. Where 5 g of the apple peel extract, 5 g of orange peel extract, 5 g of banana peel extract, 5 g of lemon peel extract was mixed and triturated with 5 g of carbopol 934 and 1 g of sodium benzoate was added as a preservative in a mortar and pestle. To it 2 ml of Tween 80 was added to remove the stickiness and further 1 ml of glycerin was added triturated well, to the above content 80 ml of demineralized water was added and finally made up to 100 g. pH was adjusted with a solution of sodium hydroxide. Clove oil was added at last to mask the bitter taste and to give anti-inflammatory effect. The MIC of the hydroalcoholic extracts was specified in [Table 2]. The low MIC value indicates that the extract has strong antibacterial activity the result revealed the hydroalcoholic extract of the Malus domestica, Fig 1 shows the serial dilution method conducted for the antimicrobial study of apple peel ectract (Malus domestica) against ( S.mutans ) organism. Citrus sinensi (L.), Citruslimon, Musa acuminata Colla. Possess good antibacterial activity against both Gram-positive and Gram-negative bacteria. The above result helped us to determine in what concentration the extract should be used in the formulation of toothpaste. The extracts studied for antibacterial activity showed good sensitivity toward the bacteria S. aureus, P. gingivalis, S. mutans, and E. faecalis for different dilutions. As shown in [Table 2], in which all the extracts have shown good sensitivity against all organisms. All the extracts are more sensitive to P. gingivalis as compared to other organism. Apple peel 7.8 mg/ml, banana peel 31.25 mg/ml, lemon peel 15.63 mg/ml, orange peel 62.5 mg/ml. The formulated polyherbal toothpaste was also screened for the antibacterial activity against the four microorganisms (S. aureus, P. gingivalis, S. mutans, and E. faecalis). The polyherbal toothpaste showed promising results, similar to the marketed toothpaste, at all the dilutions, against P. gingivalis and E. faecalis whereas it showed sensitivity up to 0.4 μg/ml against S. aureus. The MIC of the test formulation against S. mutans was 6.25 μg/ml, which was very high when compared to the marketed toothpaste. Demineralized water has been used in this formulation, instead of alcohol; hence this formulation is free from alcohol and not habit forming. Glycerin has been added which is an astringent and also helps in strengthening the gums of the oral cavity. Hence, the polyherbal toothpaste formulated is of much advantage when compared to the marketed toothpaste. A study effort has been made for preparing new polyherbal toothpaste by combining the different fruit peel extracts against organisms causing dental caries and infections. For the present study apple, lemon, banana, orange were subjected for extraction and these extracts were subjected for the anti-microbial activity. Finally, the polyherbal toothpaste was tested for antibacterial activity and was compared with commercial toothpaste. The result shows significant antibacterial potency for the polyherbal toothpaste for commercial use. Authors thank VGST-SPiCE Government of Karnataka for supporting this research by providing necessary financial support. 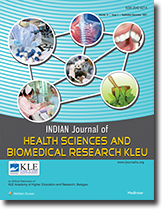 Authors also thank Principal, KLE's College of Pharmacy, Belagavi, for supporting this research work. Author is also thankful to Deputy Director, KLE Dr. Prabhakar Kore Basic Science Research Center, Belagavi, and Karnataka for providing necessary support for the antimicrobial activity. Bowen WH, Koo H. Biology of Streptococcus mutans-derived glucosyltransferases: Role in extracellular matrix formation of cariogenic biofilms. Caries Res 2011;45:69-86. Knoll-Köhler E, Stiebel J. Amine fluoride gel affects the viability and the generation of superoxide anions in human polymorphonuclear leukocytes: An in vitro study. Eur J Oral Sci 2002;110:296-301. Neumegen RA, Fernández-Alba AR, Chisti Y. Toxicities of triclosan, phenol, and copper sulfate in activated sludge. Environ Toxicol 2005;20:160-4. Cowan MM. Plant products as antimicrobial agents. Clin Microbiol Rev 1999;12:564-82. Ahmad I, Beg AZ. Antimicrobial and phytochemical studies on 45 Indian medicinal plants against multi-drug resistant human pathogens. J Ethnopharmacol 2001;74:113-23. Agarwala M, Yadav RN. Phytochemical analysis of some medicinal plants. J Phytol 2011;3:10-4. Al-Kholani AI. Comparison between the efficacy of herbal and conventional dentifrices on established gingivitis. Dent Res J (Isfahan) 2011;8:57-63. Weinert W. Oral hygiene products. In: Wiley VC, editor. Ullmann's Encyclopedia of Industrial Chemistry. Vol. 18. Weinheim:Wiley VCH; 2005. p. 209-15. Bhowmik D, Sampath Kumar KP, Yadav A, Srivastava S, Paswan S, Dutta AS. Recent trends in Indian traditional herbs Syzygium aromaticum and its health benefits. J Pharmacognosy Phytochem 2012;1:13-22. Rehman ZU. Citrus peel extract - A natural source of antioxidant. Food Chem 2006;99:450-4. Kokate CK, Purohit AP, Gokhale SB. Stass-otto method. Text Book of Pharmacognosy. 47 th ed., Vol. 2. Nirali Prakashan; 2004. p. 3.3. Andrews JM. Determination of minimum inhibitory concentrations. J Antimicrob Chemother 2001;48 Suppl 1:5-16. Shafiei Z, Shuhairi NN, Md Fazly Shah Yap N, Harry Sibungkil CA, Latip J. Antibacterial Activity of Myristica fragrans against oral pathogens. Evid Based Complement Alternat Med 2012;2012:825362. Vimaladevi M. Text Book of Cosmetics. 1 st ed. CBS Publication; 2005. p. 114. Jenner F, Jaleel VA, Kulshrestha R, Maheswar G, Rao PK, Kranthi J. Evaluating the antimicrobial activity of commercially available herbal toothpastes on microorganisms associated with diabetes mellitus. J Contemp Dent Pract 2013;14:924-9. Schwalve, Moore, Goodwin. Textbook of Antimicrobial Susceptibility Testing Protocols. CRC Press; 2007.